Willaim de Burgo founded the Franciscan friary in Galway in 1296. It later became a place for special theological studies. 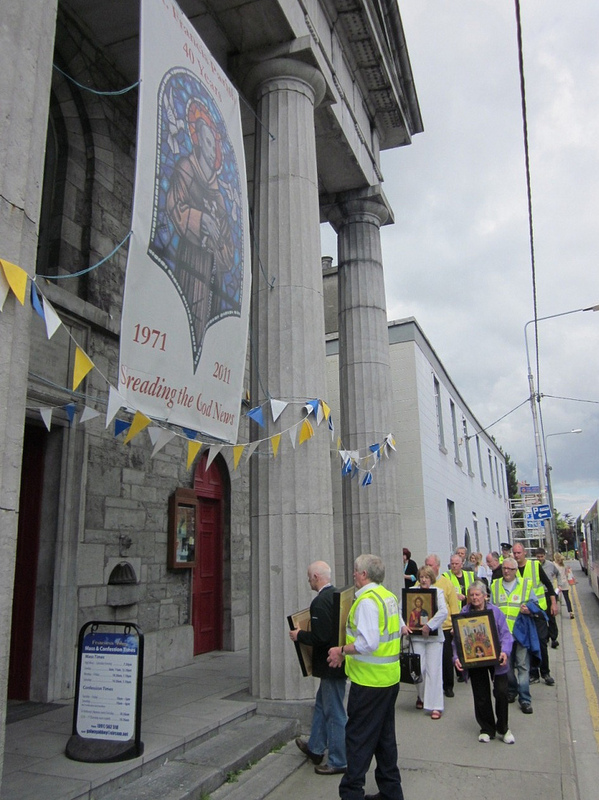 The Conventuals contested the taking over of Galway friary by the Observants. The co-operation of the local officials enabled the friars to escape suppresion and to live in relative peace until 1583, when they were expelled. On their return in 1612, they probably settled on the present site, but were again expelled by the Cromwellians. They returned once again in 1660 and were able to maintain a community there all through the hard times of the eighteenth century (four in 1724, thirteen in 1766, six in 1801). Work on a new church began in 1781, but the present building was not finished until about 1836, and not consecrated until 1849. The friary in its present form dates from 1820. The church is reputed to be the first in Ireland which was dedicated to the Immaculate Conception. The area around the ‘Abbey’ became the first Franciscan parish in modern Ireland in 1971. The medieval friary was on St. Stephen’s Island where the courthouse is now. St Francis: medieval stone carving in present friary garden.